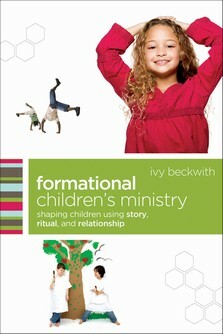 i recently mentioned that i was especially excited to read ivy beckwith’s new book, formational children’s ministry. my sweet husband bought me the book for christmas and now that i’ve completed it – i only want to discuss it with every children’s leader that i know (and even those i don’t know!). similar to her first book postmodern children’s ministry ivy once again encourages and gently challenges all of us to consider a new approach – a formational approach to inspiring faith in our children. i believe this book is important and even crucial for all of us considering the future of children in the church. and that’s why in late february, together with ivy and baker bookswe’ll be hosting a book blog tour – so that you can hear from various children’s ministry professionals on their opinions and practical applications of the book. our participant list is almost complete – but we are looking for 2 additional children’s ministry bloggers who would be interested in reviewing the book and participating in the blog tour. If you still need additional bloggers, I’d love to participate! Have seen the book on Henry Z’s site, but haven’t had a chance to read it yet! hi barbara – thank you for your interest! i’ll email you with the details! thank you to everyone who tweeted and emailed – we have our 2 participants! look for the book blog tour at the end of feb!